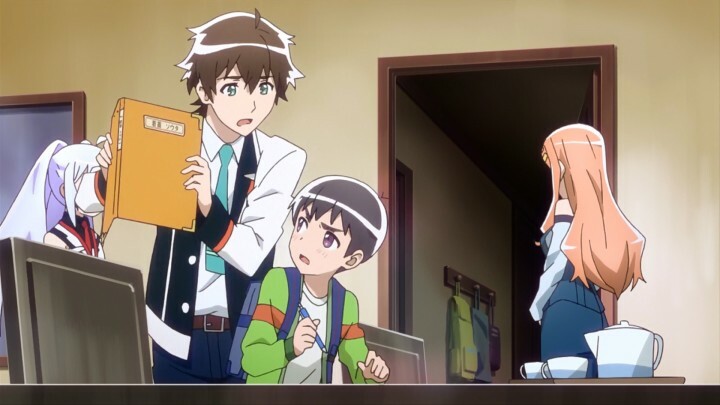 Plastic Memories is an anime about androids and love where the premise gives the idea that it will deal with topics like end-of-life care, euthanasia, and the memories left behind by those that have passed. But what could’ve been an interesting point to discuss and explore in the format of animation is vastly obscured by a love story that is as predictable as somewhat questionable. While the very last parts manage to be better than everything before them, they’re not enough to make up for all its other faults. The first episode opens up with the typical scene of the main character, Tsukasa, running because he appears to be late to something; this time it’s to an elevator, inside of which he finds a girl in tears and becomes instantly infatuated with her. This is the moment that pretty much defines what kind of story this is, and from here on it rarely strays away from the beaten path. Next scene we learn that Tsukasa is a new employee in the Terminal Services Department of the SAI Corporation, responsible for producing androids, called Giftias, that look and act exactly like humans. As an agent for the Terminal Services, his duty consists of retrieving Giftias whose shelf life is about to expire — roughly 9 years and 4 months — and for that he’s partnered with Isla, who turns out to be none other than the girl he bumped into the earlier scene. Isla acts very distant towards anyone in the room to the point of uttering “Error” in a deadpan tone whenever she tries to evade something uncomfortable. The first three episodes focus on three main aspects of the story. First are the characters’ introductions: there are around a dozen regulars, but from those (besides the obvious main ones) there are two secondary characters that help the most to carry the story out. One of those is Michiru, who neatly fits the role of “the tsundere with a sad past,” and the other is Kazuki, the somewhat violent and overprotective quasi-mother figure that can’t hold her alcohol. There are others (plus a number of incidental characters), but most of them have bit parts and very few interesting characteristics, meaning that they barely stand out of the background. Most characters barely stand out of the background. The second aspect is the world building, which mostly occurs in bursts of plot dump by characters directly addressing the subject matter. We’re told that the reason why such a service exists is because when a Giftia isn’t processed before reaching the end of its shelf life, its memories will start deteriorating rapidly, which can alter its personality and make it incredibly dangerous to the general public. Another thing we learn is about the division of labor between the human-Giftia partnership: out in the field the Giftia takes the role of the marksman, who is charged with negotiating with the target and its owner, while the human’s role is that of the spotter, whose job is ensuring that the procedure goes off without a hitch and to act as support when needed. With names like “marksman” and “spotter” one would expect situations similar to hunting, but this is rarely the case except in one instance, and even then it’s kind of a stretch. The third, which is the most important one since it’s an ongoing thing throughout the show, is the development of the bond between Tsukasa and Isla. 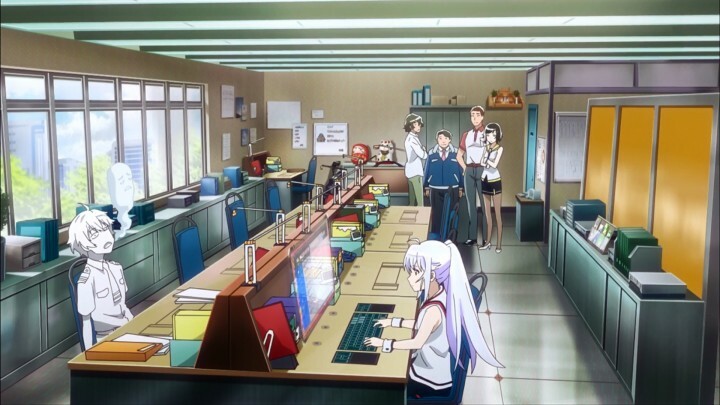 At various points we get to see that Isla seemingly prefers to stay out of anyone’s way while at the same time have them stay away from her (even though she’s showered with affection by everyone around her for whatever reason), yet she keeps working willingly in a job she herself describes as unrewarding. Anyway, Isla had been out of the field for quite some time and is underperforming, which makes things harder for the inexperienced Tsukasa to show results. 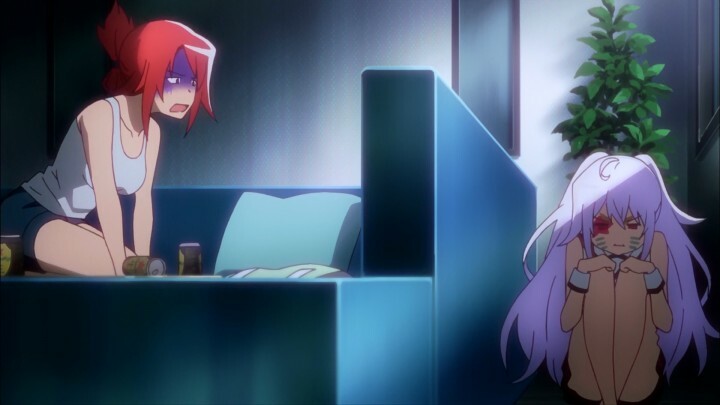 This forces them into a dynamic where Tsukasa and Isla support each other in order to have the job done, and to boot it just so happens that partners have to move in together, conveniently giving Tsukasa a better chance to get closer to our sad sack of bolts and moe. By the way, this whole branch of the Terminal Service lives in the same building, and Michiru is Tsukasa’s next door neighbor…yeah. By now, with only this much information, you can already make the connections and extrapolations necessary to make educated guesses of what’s going to happen and how it will play out with a fair amount of accuracy. In other words, it’s pretty predictable. In this next set of episodes, Tsukasa and Isla are assigned to retrieve a Giftia called Marcia, who’s been acting as Souta’s guardian after his parents died three years ago. When they visit, the pair is welcomed by a very cheerful Marcia who soon starts talking about her family, their past, and how she worries about what will become of Souta when she’s gone, but when Souta himself shows up he’s eager to sign the form. This proves to not be conducive towards drama, thus our hero can’t let it end so easily, so he doesn’t let Souta sign, who in turn calls everyone a Giftia and a liar and runs away. A perfect performance. Michiru, it turns out, was also raised by a Giftia who some years ago ended up living past his expiration date, then got gunned down after losing his mind and attacking Kazuki, who was at that time assigned to retrieve him. Feeling that sort of connection she jumps in to aid Tsukasa and Isla with the case. After another emotive scene where everyone helps to put up a birthday party for Souta, he and Marcia make up, paving the way for more proper drama. Because things apparently can’t move forward without forced conflict, the next day Marcia is kidnapped by a black market retriever. This proves to complicate things a whole lot more for Terminal Services, because this could end up with her becoming a threat. Making a long story short, the Department ends up in an uneasy cooperative relation with what seems to be a Private Military Company owned by SAI Corp, where both are hunting the rogue Marcia that has escaped and taken a distraught Souta. The conflict ends with a crying Tsukasa, armed with a special gun, shooting the target after Isla tries, and fails, to do something useful with a very odd looking sword-thing. In the last episode of this batch we see that Isla overloaded herself and has to stay in bed while being checked by the Engineering Department. Tsukasa, who was made to do desk work for the time being, pays visits regularly to Isla trying to cheer her up, which kind of works after she confides in Michiru that she can’t stop thinking about him, especially because Tsukasa keeps smiling even after what they went through in their last case. Close to the end of the episode, Isla overhears Kazuki revealing to Tsukasa about Isla’s lifespan and asks if, since it’s about to end, he’d be interested in pairing up with someone else or if he’d rather stay with Isla. Tsukasa, although overwhelmed, says he’d much rather stay with Isla until the end, which greatly pleases Isla. By this point I’ve been getting more enjoyment out of trying to guess as accurately as possible how the show will develop rather than from the show itself. This batch opens up with Tsukasa and Isla getting along better than they used to, and to capitalize on this new development, Tsukasa decides to ask Isla out on a date. 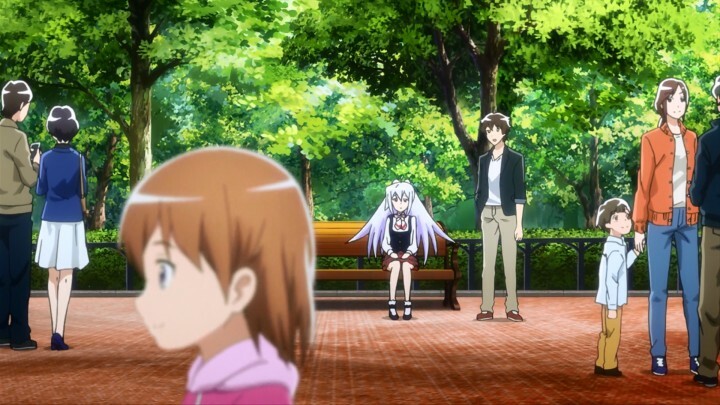 Isla picks the amusement park where they have a touching moment, where Isla tells Tsukasa that, back when she used to pair up with Kazuki, spending time simply looking at people’s smiles while sitting on a bench made her feel better. Due to various circumstances, Tsukasa and Isla end up in something like a double date with two other background characters, Eru and Andie. This time around Tsukasa manages to confess to Isla, who in the heat of the moment freezes for a second, only to reply that she “can’t do [it].” This doesn’t fly well with Tsukasa who now has to temporarily change rooms to let things cool down. What follows is one of the most obvious developments yet and one of the least subtle injections of drama to the show, the two combining to form a barefaced attempt at tugging at your heart-strings. 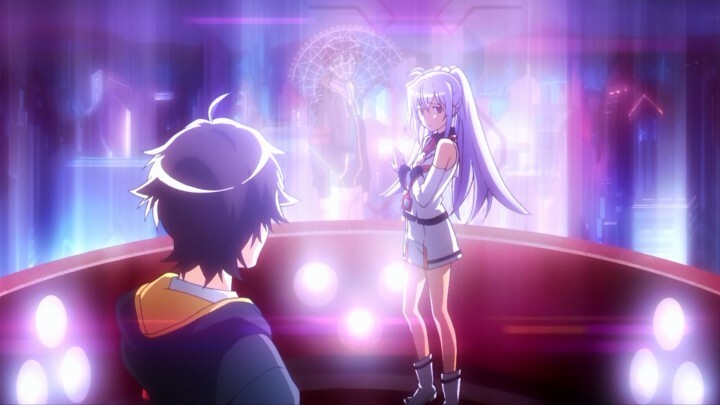 First, Isla tells Michiru that she can’t be with Tsukasa because she has only one month left; then Michiru bumps into Tsukasa and tells him that she will be rooting for them because of how impressed she is that Tsukasa is really, really into Isla; and finally Kazuki enters the picture and dissolves Tsukasa and Isla’s partnership for no real reason. There was a lot of emotion in those scenes, but I was too busy groaning at them. It turns out that Kazuki’s plan was to have Isla for herself so she could force some sense into her, to let her know that not following her feelings was something that would hurt Tsukasa more than herself. 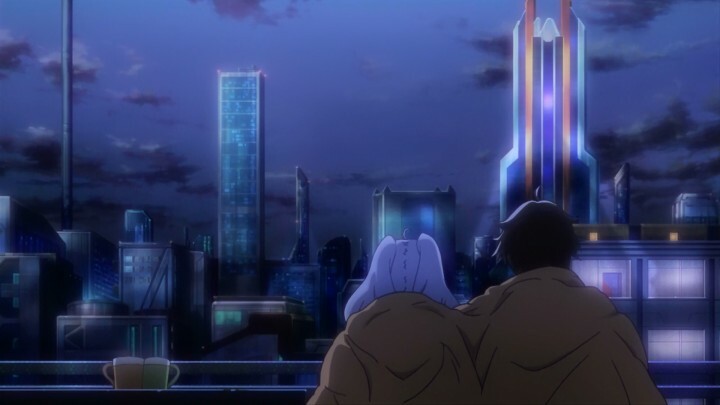 While this wasn’t done as poorly as it could have, I still can’t find a real reason for that scene where Kazuki dissolves their partnership, other than to, again, force some drama into the show. In most anime I’ve managed to finish the end goal is “to get the girl”, so the idea of seeing what goes on afterwards felt a little fresh — for about five minutes. The chances of liking Tsukasa and Isla’s dating life depends on whether or not you like the old routine of two bumbling dolts tripping, falling, and being cute with each other. The last few episodes had some good moments. Since this section is pretty much the raison d’etre for this show, I won’t go into much detail in case you decide to go for it. Instead I’m going to say that the last few episodes had some good moments. 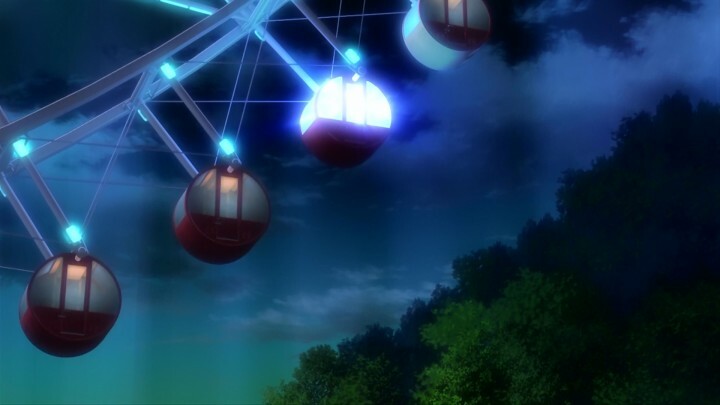 For example: the last retrieval, the farewell party, the development of Tsukasa and Isla’s relationship, and the Ferris wheel scene. But, as with everything else, the palpable intent of aggressively trying to jerk tears out of me always bothered me. Throughout the story there are too many things that happen that are too convenient to accept them without question. These end up piling up so high and so fast that they make suspension of disbelief a real problem. An example of such that in other shows might have gotten a pass are the use of androids in jobs done by humans, since they don’t seem to be more efficient than us. Another is about their lifespan — why is it that short? Why does their brain just die once a timer reaches zero? Why can bodies be recycled but not the data stored in their brains? Why does nobody bat an eye about a human-android romantic relationship? Plus many others. 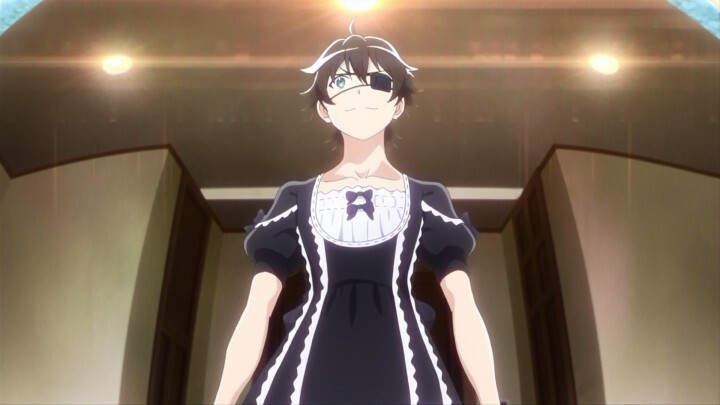 Different shows, like Time of Eve, can get away with it better because they don’t ask the audience to simply accept as facts too many things; but what helps the most is that their stories are better told, which makes the audience more interested in the story rather than in nitpicking everything they see. To conclude, I have to say that this is not a well told story with intriguing characters. Plastic Memories is to drama what the WWE is to sports: it can be entertaining, but you know it’s not only fake, but also pretty dumb.